At Bloomers, we like a good party and we hope that when you've arranged your party decor with us, yours will be just as good. Whether you want to purchase your helium, balloons, bases and ribbon from us and have a DIY do, or whether you'd like us to handle the room & table decoration putting confetti, place settings, napkins and tablecloths out for you; we will gladly oblige. You can say - "I did the balloons myself" None - Our price is ESS than your DIY package! 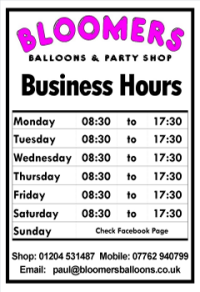 The arrangements may take you over an hour to complete Just phone to order and pay for your balloons - we do the rest.